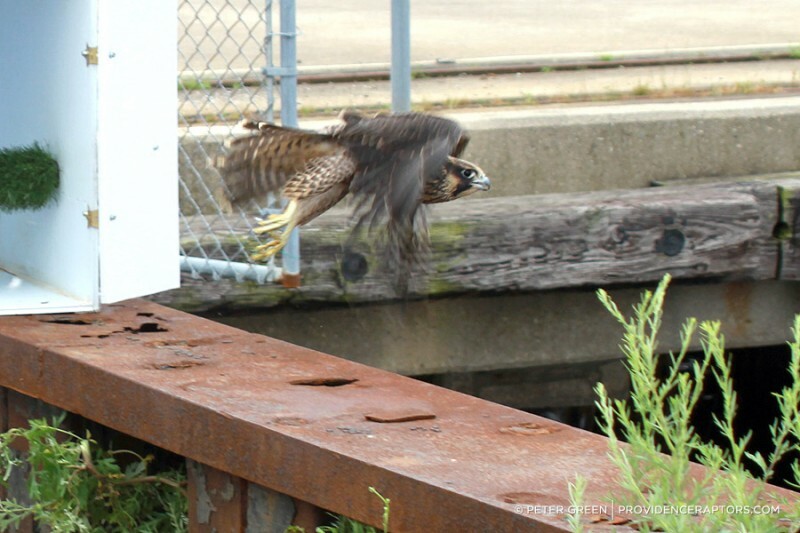 07.13.13 Filed under Peregrine Falcons. Post a comment. 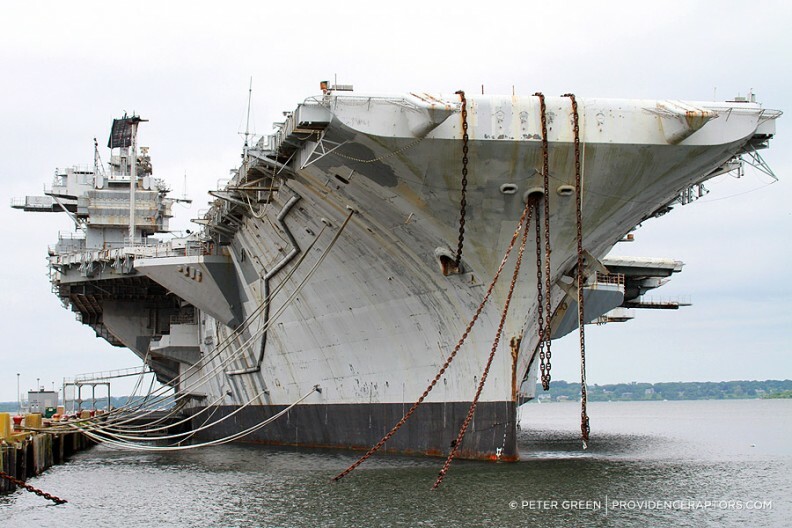 Above is the USS Saratoga, a huge decommissioned aircraft carrier currently docked at Naval Station Newport. 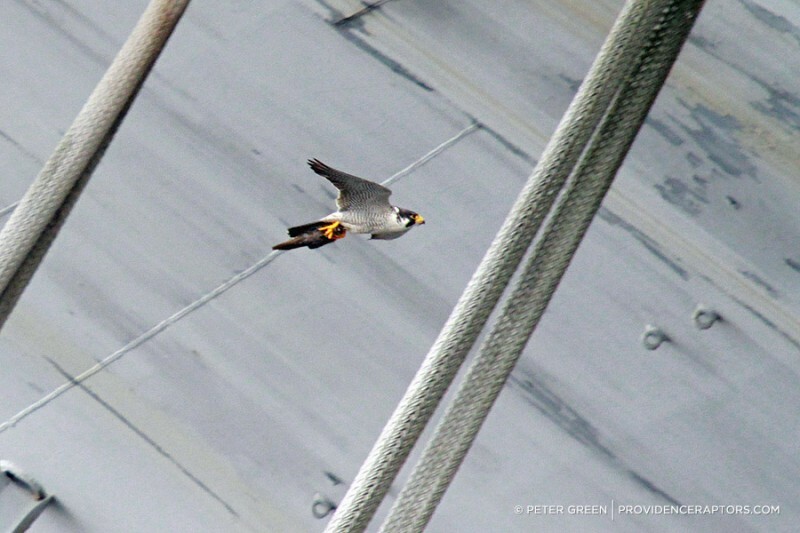 Suprisingly, it is also the home a family of peregrine falcons! 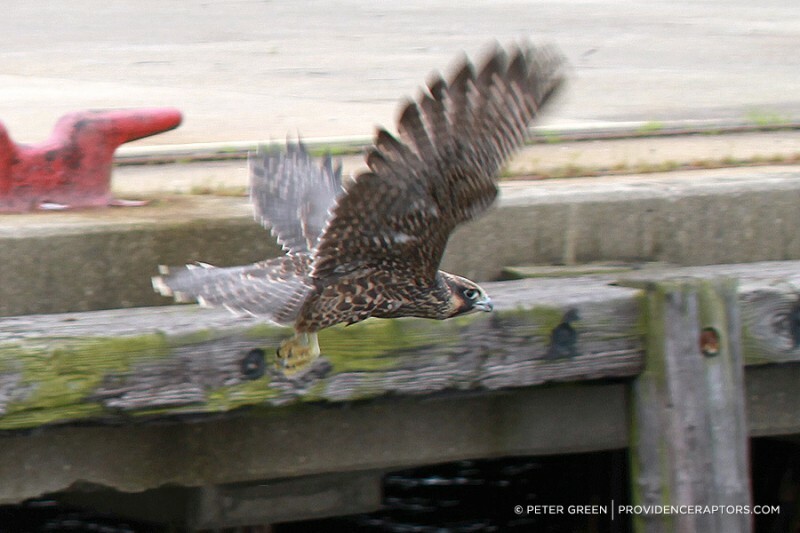 One juvenile recently crashed into the pier while chasing prey and seemed to have injured a leg. 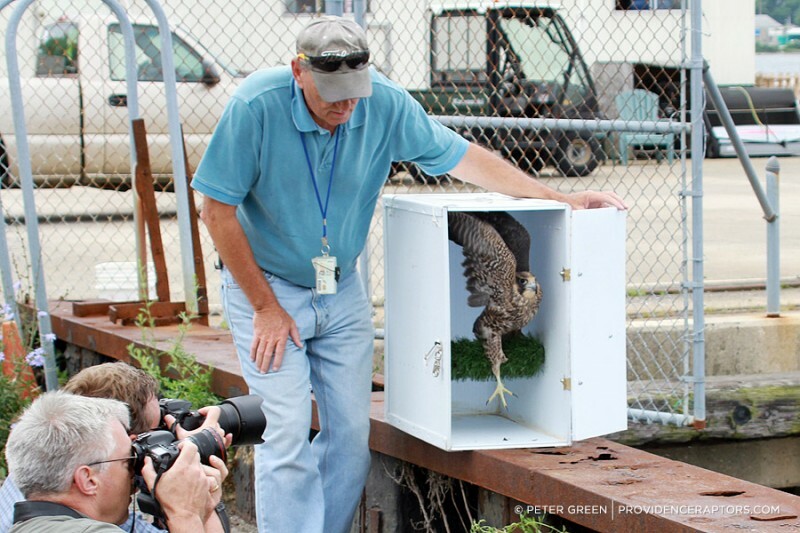 After xrays and a short stay at Born to Be Wild Nature Center, it was determined the young falcon was OK and able to be released back to where she was found. I’m grateful to have been invited to photograph the event. 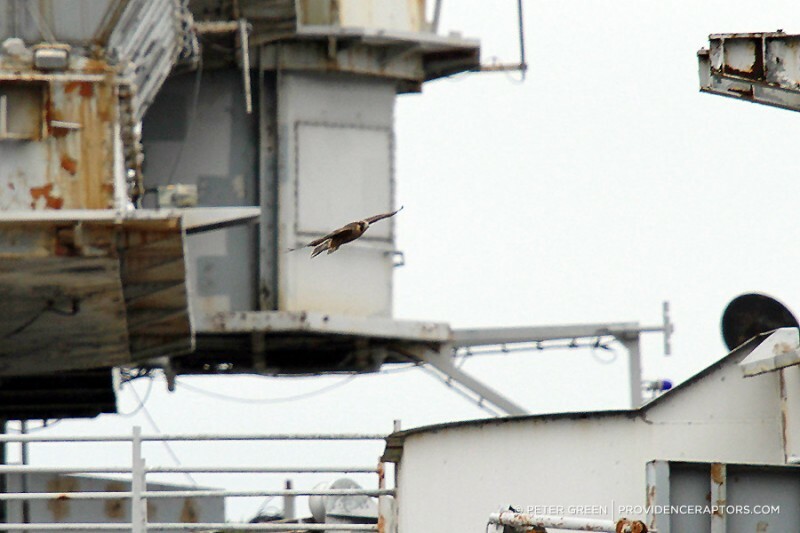 After passing through tight security at the naval base, we were escorted to the dock and right away we saw an adult falcon fly by with prey in its talons – we knew we were in the right place. 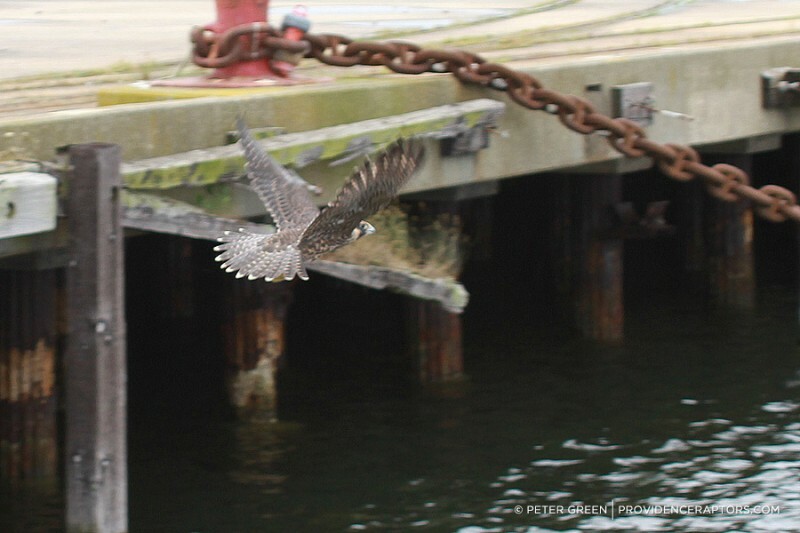 She confidently flew along the pier, landed on the starboard side of the ship, stretched her wings and knew she was home. 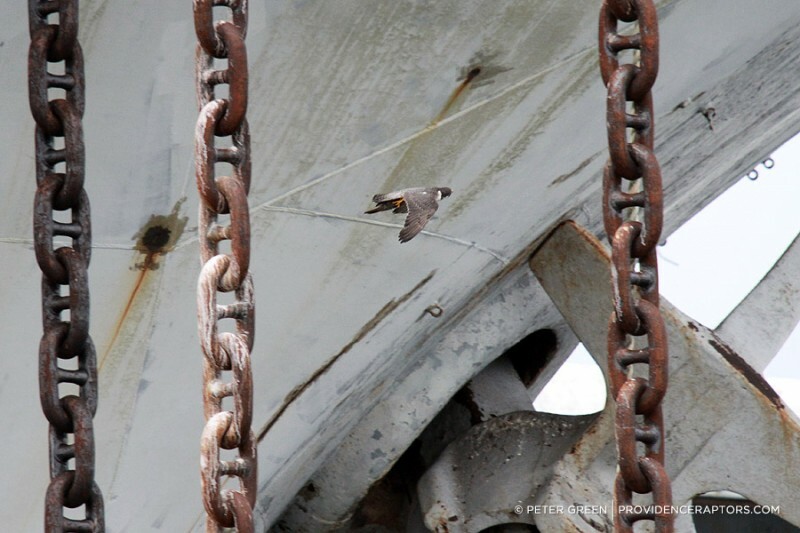 I spotted one of her siblings perched nearby, very well camouflaged against the rusting metal. 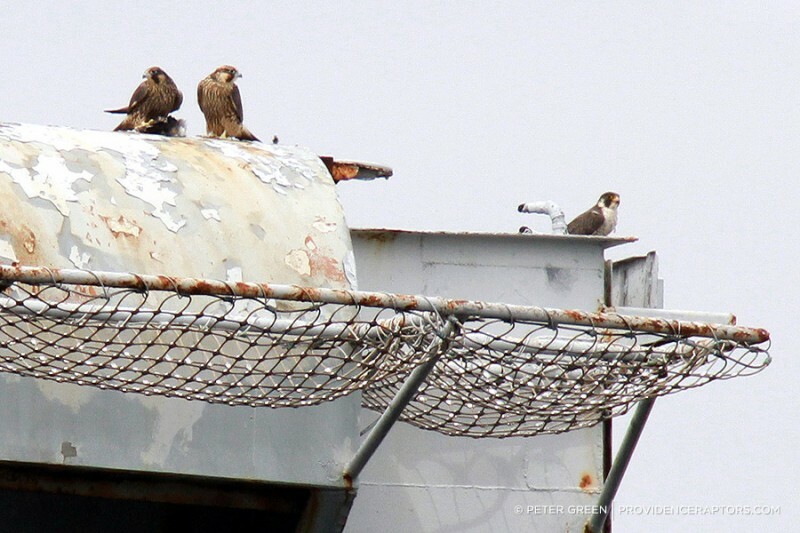 The newly freed falcon then flew to the port side of the ship where her mother had just delivered lunch to a third sibling. 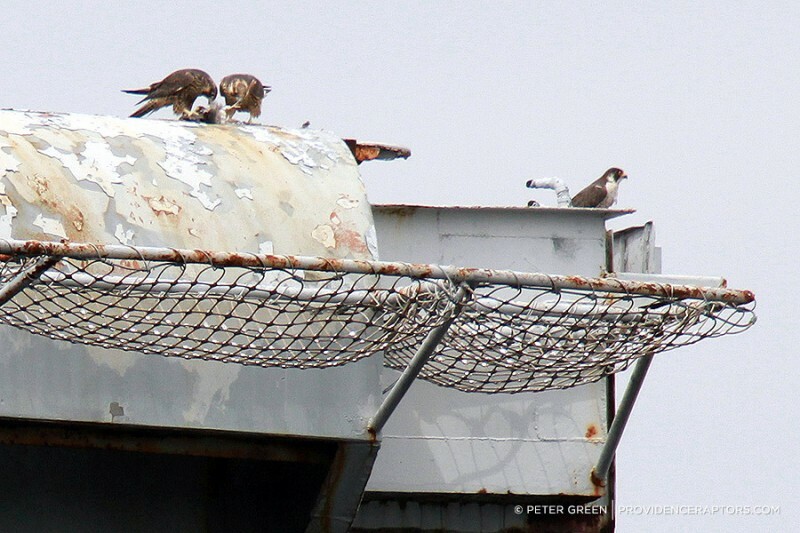 And finally, there she is lunching with her sibling and mother – back home where she belongs. 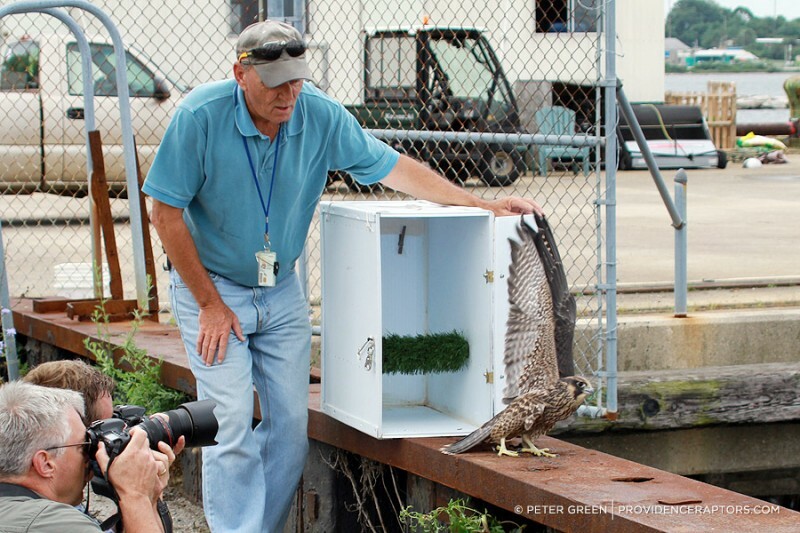 The release was also covered by The Newport Daily News and The Providence Journal, click on the links to read the articles. 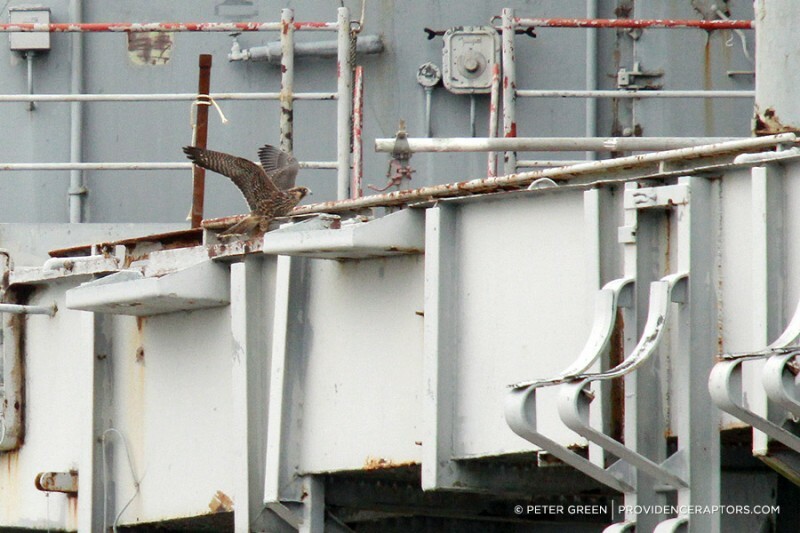 I gotta admit I’m quite jealous of the amazing shots they captured of the young falcon with the aircraft carrier in the distance behind her – spectacular! 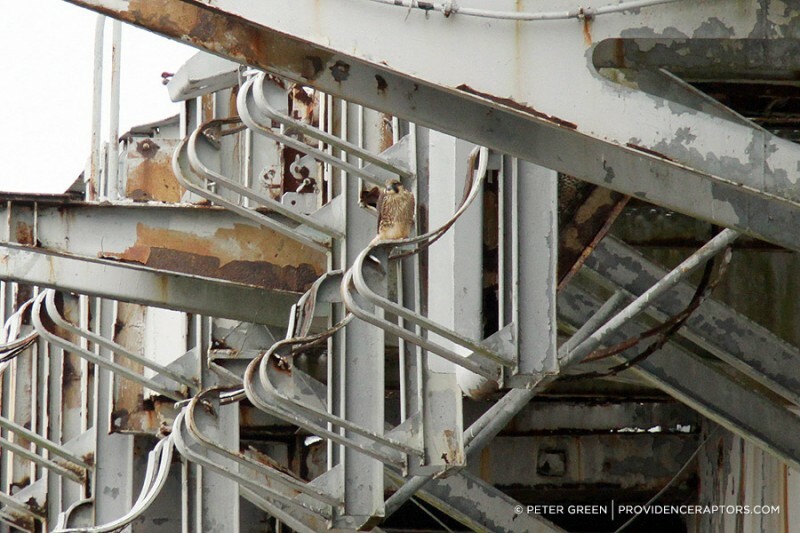 Splendid photo commentary, Peter. It’s so rewarding to play a part in the reuniting of a family! Great documentary capturing the event! 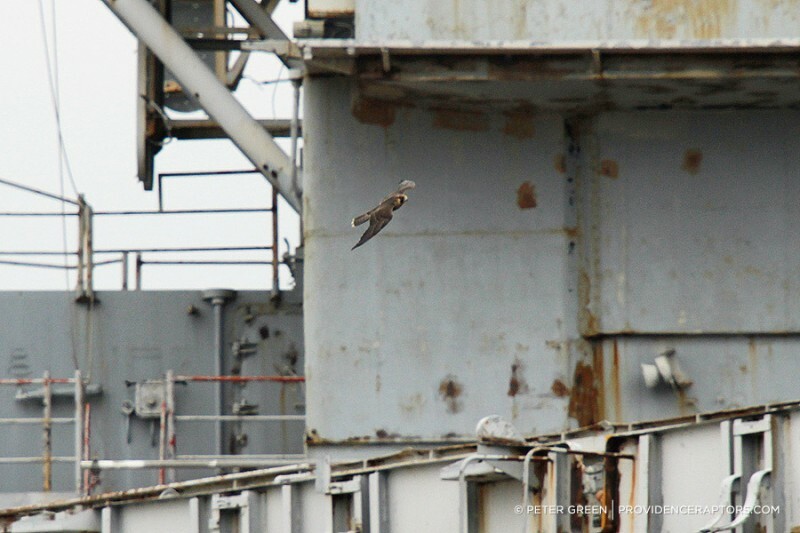 She flew so naturally to the “flight” deck! Thank you for this amazing pictorial. Also, kudos to the rescuer and volunteers. What an uplifting story. Thank you all for taking the time to comment, I appreciate it!